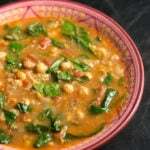 If you love lots of flavor and want a healthy meal, make this Instant Pot Moroccan Chickpea Stew. One of my family’s all time favorites! When the display reads “Hot” add the olive oil. Add the onions and stir, cooking until translucent. Add the garlic and stir, cooking for a minute or so, being careful not to burn it. Add in the cinnamon, cumin, paprika, and cayenne pepper. Stir and cook for a minute. Stir in the can of diced tomatoes, juice and all. Add the chickpeas and broth. Stir. Add the pepper, salt, and sugar, stir. Place the lid on the pressure cooker and lock it in place, setting the steam release knob to the Sealing position. Press the Keep Warm/Cancel button to cancel the Sauté mode. Press the Pressure Cook/Manual button and then the + or - button to choose 7 minutes. The pot may take 10 minutes or so to come to pressure. When the cooking cycle ends, let the IP go into Natural Release phase by letting it sit undisturbed for 15 minutes. Turn off the pot and manually release the remaining pressure. When the pin in the lid drops, and it is safe to remove the lid, do so carefully, facing it away from your face. Stir the stew and give it a taste. Adjust salt if desired. Using a potato masher, mash up most of the stew, but leave some of the chickpeas whole. This gives the stew wonderful texture. Add the baby spinach to the stew and gently stir it in. It will wilt nicely. Total cook time includes bringing pot to pressure and the natural release. Those times are approximate. Cook time under pressure is 7 minutes.